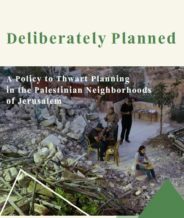 The new report demonstrates how the Israeli authorities deliberately delay and ultimately undermine the approval of plans that actually allow for construction in the Palestinian neighborhoods of Jerusalem. Since 1967, Israel has expropriated more than 38% of East Jerusalem to build Israeli neighborhoods / settlements. While 37% of Jerusalem’s residents are Palestinians, only 15% of East Jerusalem – and 8.5% of Jerusalem as a whole – has been allocated for Palestinian development. The three case studies at the center of the report represent a spectrum of plan types and promoters, in different stages of the planning system. These plans, and countless like them, have been derailed by the planning authorities. 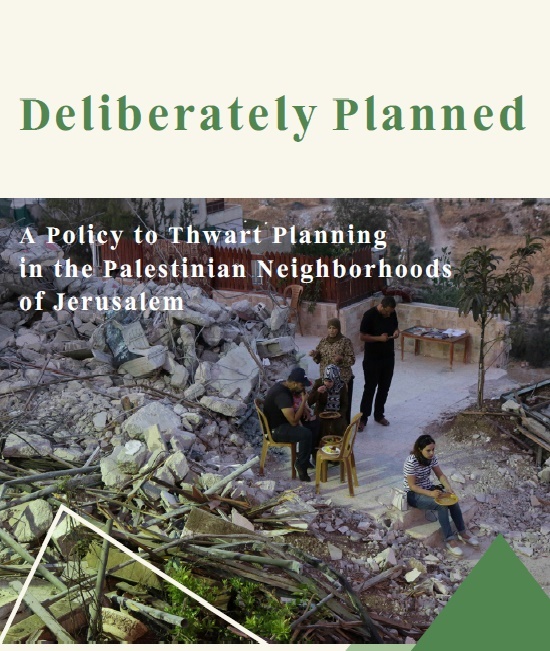 Collectively, the trajectories of these plans evidence how urban planning is used to deliberately suppress the growth and development of the Palestinian community in service to demographic objectives. This entry was posted in Publications and tagged Building Permits, Demolitions, Development, East Jerusalem, Planning, Urban Planning. Bookmark the permalink.